Starting and sticking to an exercise programme is challenging for most who are at risk of developing lifestyle-related chronic disease: the most physically inactive, unfit, and overweight or obese middle-aged individuals, that is, the majority of the adult population. The 2018 US Physical Activity Guidelines for Americans1 introduced a number of new elements that will undoubtedly change how we think about and promote physical activity (PA). Not to anyone’s surprise, the new guidelines abandoned the unsupported by empirical evidence idea that PA needs to be accumulated in at least 10 min continuous bouts to be health enhancing.1 This opens new exciting opportunities to capitalise on sporadic, incidental in nature, PA to improve the population’s health. Incidental PA: what is it and why is it appealing? Incidental PA is any activity that is part of one’s daily living that is not done with the purpose of recreation or health and requires no sacrifice of discretionary time. For example, walking or cycling to move from place to place, stair climbing and active daily chores, such as carrying heavy shopping1 and house cleaning. Inherently, incidental PA does not encounter the myriad of barriers to structured exercises, such as lack of time, costs, equipment, lack of skills or poor fitness. In itself, such a feasibility advantage may signal a turning point as fewer barriers mean that many more people can be incidentally active than recreationally active. What is far less clear is how to maximise the health impact of incidental PA and how to convince and empower people to be physically active in their daily lives. In this editorial, we address the first of these questions. The time-economy advantage of VPA1 further strengthens the case for making the most of the ‘best bang for the buck for time unit’ incidental PA. High-intensity interval training (HIIT) is a time-efficient approach to exercise characterised by brief bursts of VPA near (typically >80%) or above VO2max, interspersed with periods of low activity or rest.8 HIIT has the capacity to induce rapid peripheral adaptations (eg, activation of peroxisome-proliferator-activated receptor γ coactivator-1α and muscle mitochondrial biogenesis), as well as improve the structure and function of the cardiovascular system. These effects are linked with improvements in glycaemic control and other metabolic syndrome components and, most notably, CRF.8 High PA intensity is undoubtedly a key to these beneficial physiological changes, as the effects of very low-volume HIIT appear similar to those achieved with traditional continuous exercise. In other words, both experimental and epidemiological evidence point towards the superiority of occasionally reaching vigorous exertion over total exercise volume. Such sporadic incidental PA patterns are achievable for most adults. Drawing data from the corrected MET values of the online supplementary table 1, figure 1 illustrates two hypothetical examples of high relative intensity incidental PA patterns totalling 10 min per day for two physically inactive middle-aged individuals. Assuming that this virtually zero time commitment PA pattern is relatively consistent (eg, 5–6 days per week), the contribution of such sporadic HII PA towards meeting the PA guidelines1 would be significant (≥2/3 of the total requirement), making it a particularly attractive option for inactive, obese and other individuals in greatest need of lifestyle intervention. Hypothetical examples of a sporadic incidental vigorous PA pattern for two otherwise physically inactive individuals. (A) Corrected* MET intensities are based on a 60-year-old woman, 72 kg and 162 cm tall (BMI 27). Activities shown include walking, 2.9–3.5 mph, uphill, 1%–5% grade (Compendium code 17210); stair climbing, fast pace (17134); walking, 4.0 mph, level, firm surface, very brisk pace (17220); walking/running, playing with child(ren), vigorous effort, only active periods (05180); moving, lifting light loads (05121). (B) Corrected* MET intensities are based on a 55-year-old man, 85.9 kg and 175.6 cm tall (BMI 27). Shown activities include bicycling to/from work, self-selected pace (01011); walking, 5.0 mph, 3% grade (17235); carrying groceries upstairs (05056). *MET intensities corrected based on Harris-Benedict RMR.6 Corrected MET=Compendium of PA7 assigned MET value x (3.5/Harris-Benedict predicted RMR).6 MET, metabolic equivalent; PA, physical activity; RMR, resting metabolic rate. The 2018 US PA guidelines opened new horizons for PA and exercise medicine practice by recognising that any bouts of PA count for health.1 Building a daily routine that incorporates brief sporadic bouts of high relative intensity incidental PA has numerous practical and health advantages. The next step is to empirically examine the health effects of such PA on key outcomes in large longitudinal cohorts using wearable monitors and to develop environmental and clinical programmes promoting high-quality incidental PA during daily living. 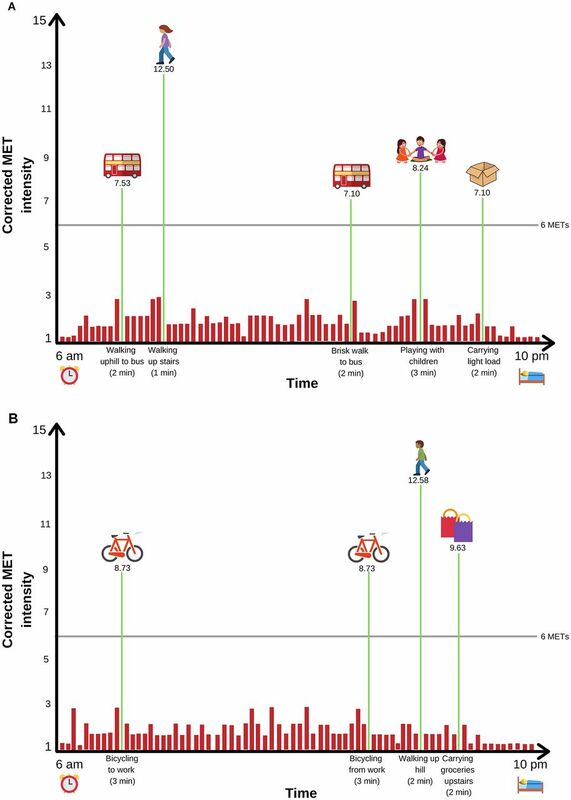 On top of ‘move as often as possible and sit less’,1 public health and clinical practice could emphasise simple messages analogous to ‘huff and puff regularly’.
. Incidental movement, lifestyle-embedded activity and sleep: new frontiers in physical activity assessment. Can J Public Health 2007;98 Suppl 2:S208–S17.
. Errors in MET estimates of physical activities using 3.5 ml x kg(-1) x min(-1) as the baseline oxygen consumption. J Phys Act Health 2010;7:508–16. Contributors ES: drafted the manuscript. All authors contributed to re-drafting and revisions of the manuscript and approved the final version.